Traditionally, one of two reasons is given for the reactivation of the Iowas in the 1980s. Either they were intended to provide fire support for amphibious landings or they were supposed to fight the Soviet Kirov class cruisers. Unfortunately, neither stands up to close scrutiny, and we have to look deeper for the logic behind the battleships being brought back into service. To do that, we must first turn to what systems were installed during the reactivation. 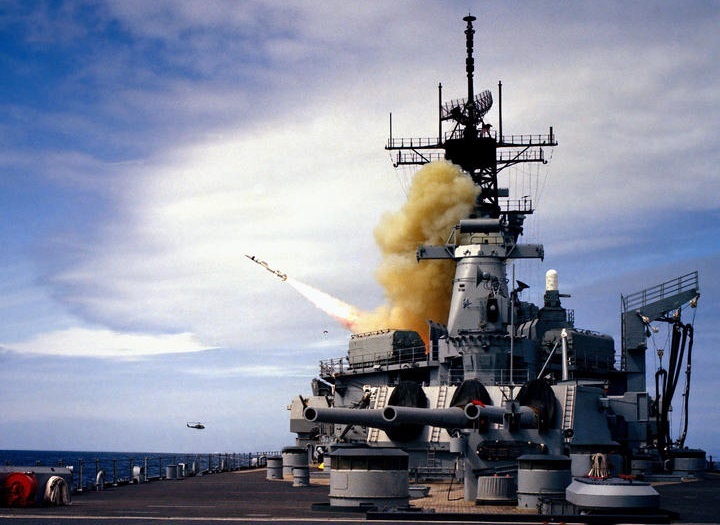 The most important of these was the BGM-109 Tomahawk, a long-range cruise missile that came in three varieties: nuclear land attack (TLAM-N), conventional land attack (TLAM-C) and anti-ship (TASM). It was originally developed in the 70s to exploit a loophole in the Strategic Arms Limitation Treaty, which restricted ballistic missiles but not cruise missiles, and then converted into conventional and anti-ship versions. Each ship received 8 quad Armored Box Launchers (ABLs), four between the two funnels and four around the aft main battery director. Each missile, which weights 2,650 lb (plus a 550 lb rocket booster) is essentially a small, low-altitude airplane, propelled by a jet engine. The TLAM-N carried a W80 nuclear warhead of up to 150 kT, while the TLAM-C and TASM were each carried 1000 lbs of high explosives. A TLAM-N had a maximum range of 1,350 nm, while the TLAM-C, with a much heavier warhead, was limited to only 675 nm, and 250 nm for the TASM1. The TLAM-N and TLAM-C were guided by a system known as TERCOM, for Terrain Contour Matching. This involved using a specialized radar altimeter to locate the missile's path in a digital elevation map of the terrain. 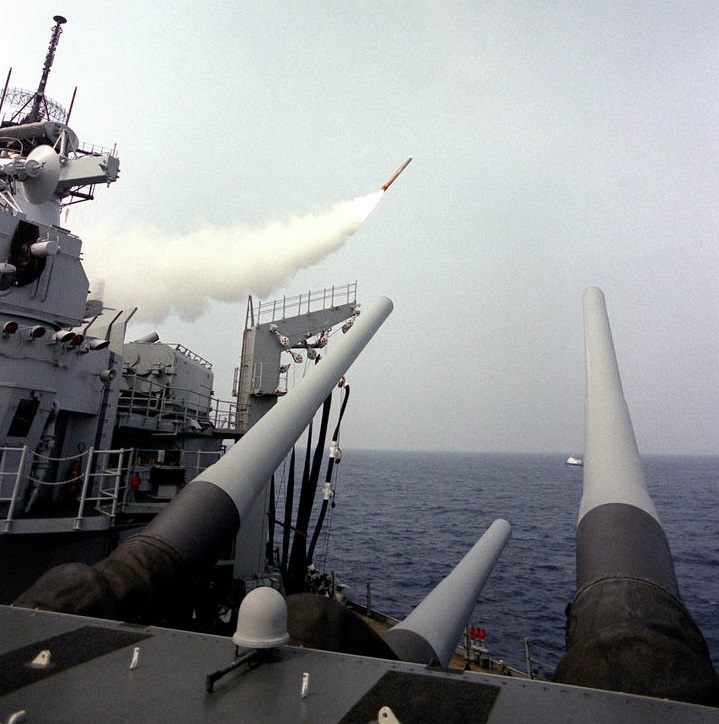 The major drawback to this is that it required the missile's route to be precisely mapped, which is why modern Tomahawks have switched to GPS.2 The conventional Tomahawk also used a special scene-matching system to get the required accuracy, although it too required extensive preparation. 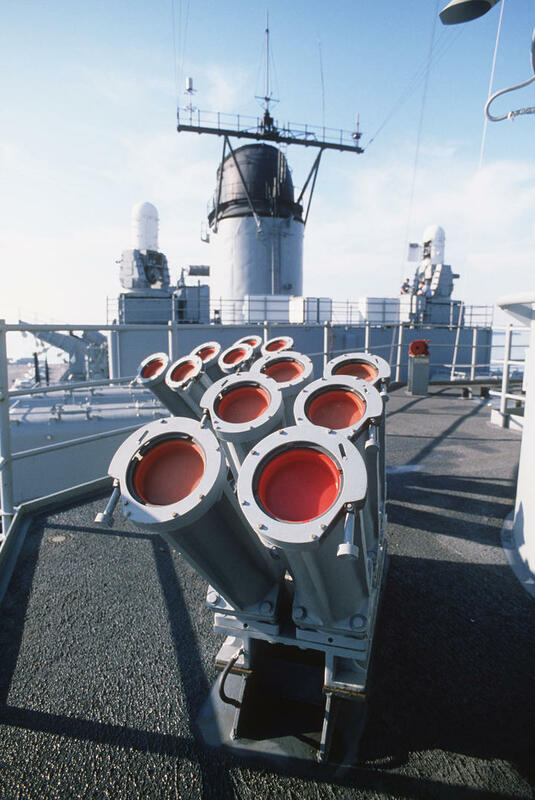 The TASM attempted to get around the limitations of long-range anti-ship missiles by searching for the radar emissions of the target before doing final homing using an active radar seeker. The second missile system installed was the RGM-84 Harpoon, with four quad launchers, two on either side of the after stack. The Harpoon is an anti-ship cruise missile, in common use by Western navies, and launched from both ships and airplanes. 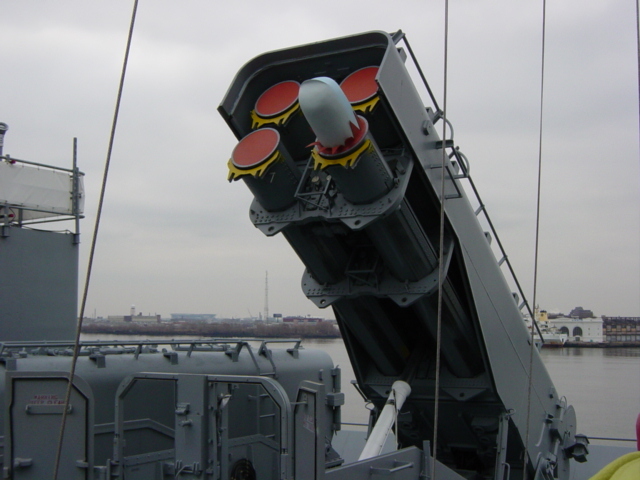 It's shorter-ranged than the TASM, only able to reach out approximately 80 nm.3 The 500 lb warhead is adequate for attacking smaller vessels, although it was estimated that it would take two hits to disable a frigate and four to take out a missile cruiser. Guidance was a radar seeker, as the ability of targets to move during a missile's flight was much less than for a TASM. 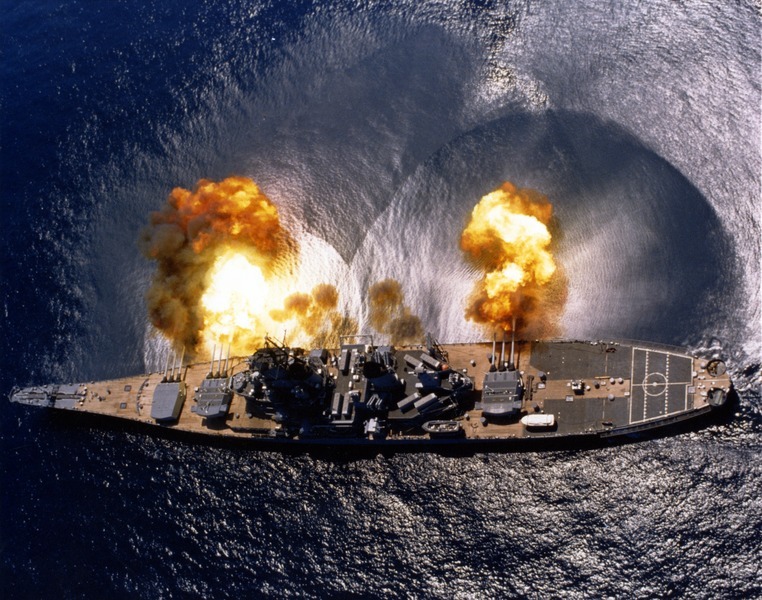 The battleship's defenses were also improved to protect them against anti-ship missiles. 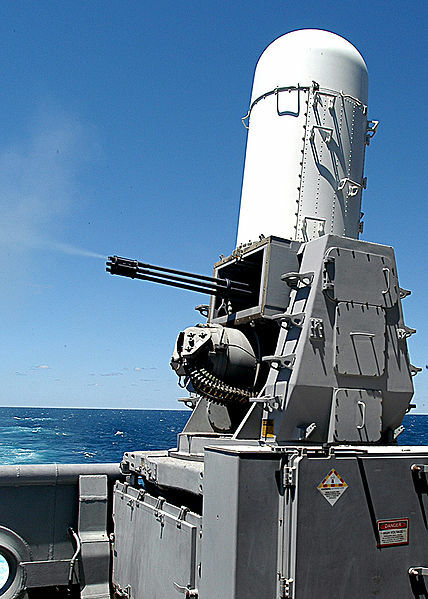 The most prominent additions were the 4 Phalanx Close-In Weapons Systems (CIWS). Each is a 20mm gatling gun hooked up to specialized radar. This radar has two antennas, one of which tracks the incoming missile, while the other one monitors the outgoing bursts and corrects the system's aim to make sure that it hits. Each of the 3,000 rounds fired each minute (usually in bursts of 100) is a subcaliber depleted-uranium projectile in a sabot that is discarded after it leaves the muzzle. The system is entirely autonomous, and if it's in the right mode will attack anything it thinks is a missile.4 There's also a manual mode for dealing with things like attacking speedboats. The USN still uses upgraded variants to this day, and the units currently installed on Iowa are dummies5. To back up the CIWS, the SLQ-32(V)36 electronic warfare system was installed. 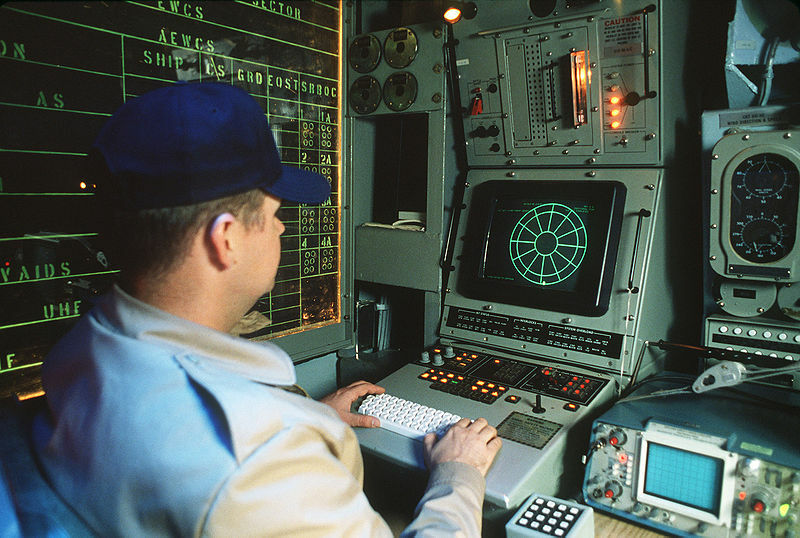 It will automatically detect and, if necessary, jam radar signals across the spectrum, as well providing classification data to the ship's combat officers. The antennas are a clever electronically-scanned lens, and are mounted high in the superstructure. It also controls the Mk 36 Super Rapid Blooming Offboard Chaff (SRBOC) launchers. Chaff is essentially shredded tinfoil, used to create false targets for missiles. Each ship has eight sextuple launchers on the 05 level near the amidships Mk 37 directors. An SLQ-25 Nixie torpedo countermeasures system was fitted in the stern. The Nixie is a towed torpedo decoy, designed to mimic the ship's sounds and draw off hostile acoustic homing torpedoes. The radar fit was also improved. An SPS-49 air search radar and an SPS-67 surface-search radar were fitted, replacing the 50s-vintage electronics previously on the ship7. Upgraded radio and IFF8 equipment was installed, most prominently the whip antennas in the superstructure and the HF discone for NTDS9 on the bow. Amphibious support can't be dismissed out of hand. As I discussed in Iowa Part 6, it was the major reason for the retention of the ships during the 70s, and the support of the Marine Corps was vital for the political side of putting the ships back into service. But the nature of the reactivation, and their use afterwards, was not what we'd expect if amphibious fire support was the sole motive. If that had been the case, the ships would likely have received an austere reactivation more along the lines of the one New Jersey got before going to Vietnam. The systems to handle the Tomahawks and Harpoons, and the loss of 5" guns, worked directly against the needs of amphibious fire support. The second reason is that it was a cheap way to get more capital ships. While a VLS-equipped destroyer has more strike firepower than an Iowa, at least past the range of the guns, a battleship has presence in a way that the destroyer does not. In peacetime, one of the major tasks of a navy is to sail around, showing the flag and reminding people that messing with its country is a bad idea. Capital ships, something bigger than the run-of-the-mill surface combatants, are necessary for this job, and the Iowas were possibly the most effective ships ever devised for this role. While a carrier may be more lethal, it's nowhere near as charismatic or as easy to understand on a gut level. And being able to buy four more capital ships (to supplement the 16 carriers) for the cost of a Perry class frigate each would be a fantastic bargain. These two factors also explain the rapid demise of the ships at the end of the Cold War very well. 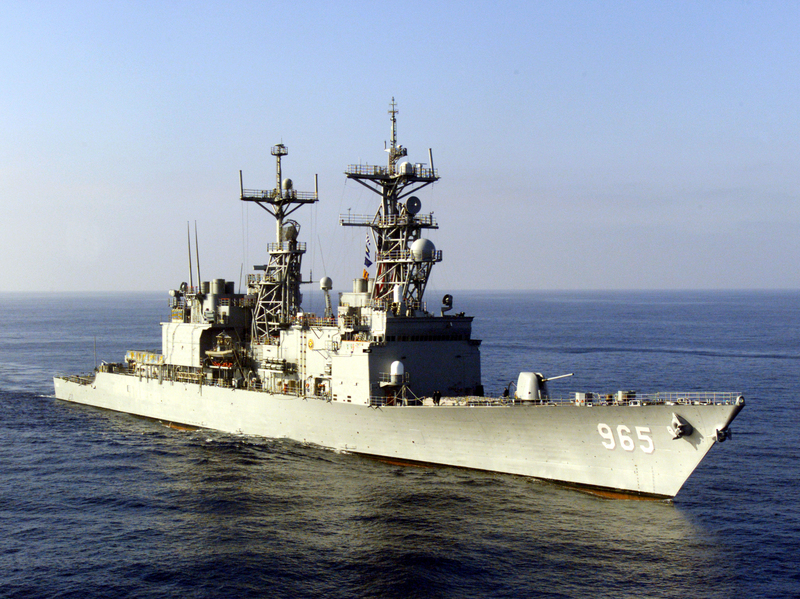 VLS-equipped destroyers entered service in large numbers starting in the late 80s, and the collapse of the Soviet Union meant that the number of capital ships the US needed was much smaller. As the least effective capital ships in military terms, there was no reason to keep the Iowas in service, and they were rapidly decommissioned. 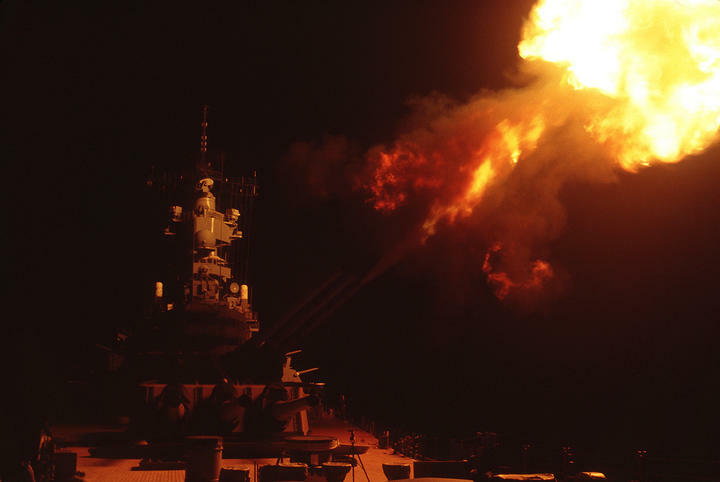 Now that we understand why the battleships were brought back into service in the 1980s, we can evaluate the idea of doing so again today.